I love the trendy bohemian styled storage baskets I see at Anthropologie right now. But they are so expensive that I haven’t been able to justify having one in my own home. Today’s DIY Project? An Anthropologie Inspired basket for less than $5. My DIY Anthropologie Hack is on the left and the top and the original Anthropologie basket is on the bottom right. My Pottery Barn Inspired Tassel Garland and Magnolia Market Hacked Embroidered Throw Pillow (also with tassels obvi) went over so well that I decided to try and hack another one of my favorite (and expensive!) stores, Anthropologie. Into this macrame Anthropologie inspired basket. For the full tutorial check out my video tutorial (and if you like it, don’t forget to subscribe!). And if you aren’t a subscriber yet, let me know down in the comments below what brought you here! Why did you click on it this tutorial? Today’s project is inspired but this Anthropologie basket that retails for an unbelievable $123. 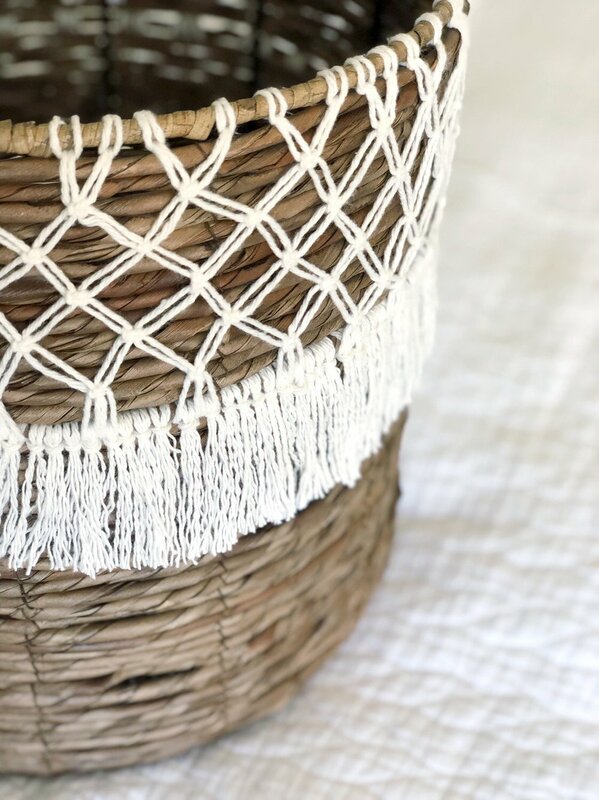 What I love about this basket is that it’s totally pulling that bohemian vibe that is everywhere right now but it also has a more modern spin by keeping the pattern very simple and geometric. AND- when this trend dies- as all trends do (trust me) - you can easily cut the strings off and transform this basket into your next interior design style. My basket is a different shape than my inspiration basket and honestly I wish I had found a cheap basket more like the inspiration basket - but I was anxious to get going on this project and I already had this one! Plus this string design is going to look good on any basket. All you need for this project is a basket and some 100% cotton String. The 100% cotton part is important. You will not get the same look with wool yarn! I’m using this 4 ply medium weight string that I got at hobby lobby. It’s normally $14 but I did use a 40% off coupon. And as you can tell this is a lot of thread so I will have plenty left for other projects! Now all baskets are different so it’s hard to tell you exactly how long you need your yarn but since my basket is 12 inches tall, I’m cutting my string at double that length so that I have plenty to work with. To start with, fold a piece of string in half and pull it through your basket under the first row of the basket. Pull the loop and back towards the outside of the basket and pull the tails of the string up and through the loop. Tighten the “knot”. Repeat this step until there are enough strongman tighten to the top of your basket. Follow that row with a second row exactly the same way. This time your square knots should be centered under two knots from the first row. I think you get the drift at this point. Continue to add rows until your macrame is the desired length! For me this was 5 rows. When you finish with the rows of square knots, pull the loose strings through your basket to the inside of your basket. Then, using a crochet hook (I just found that the easiest), pull the strings back out to the front by going through the basket one row above where you went in to the basket. 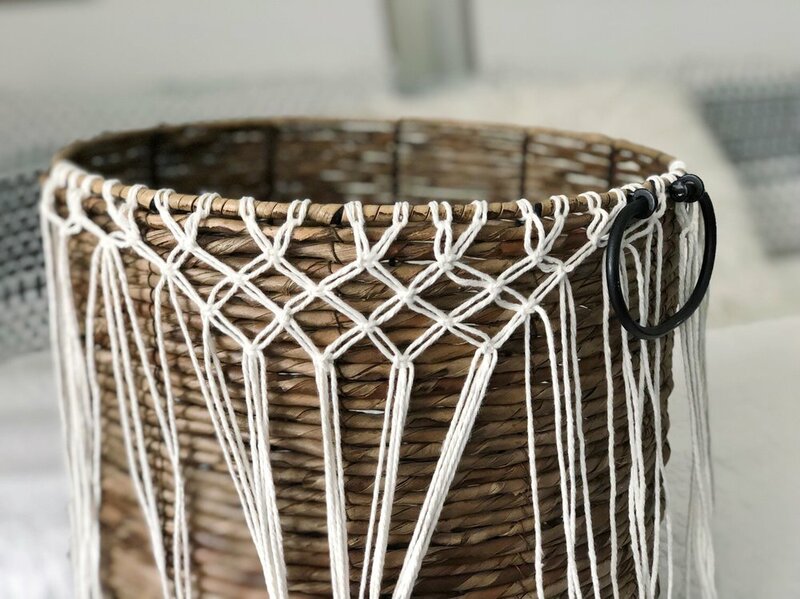 The last step is to tie a string around each of the tails that are now hanging down on the front of your basket so that they look like tassels and then add tassels all the way around your basket. Trim the fringe so that it is all one length and you are done! If YOU have a decor piece from a store that you love (but is probably expensive) and you want me to try to bring you a tutorial on hacking that piece, leave me a comment below!